It’s time to give these beautiful blooming perennials another try — but you’ll still need a strong staking system. FEW FLOWERING PERENNIALS can match the elegance, beauty and allure of Delphiniums: Humans, butterflies and hummingbirds all are crazy about them. Although some varieties grow from 2 to 6 feet tall, the queen of this royal family of plants has to be Delphinium elatum. These gorgeous plants produce 6-foot-tall, towering racemes packed with brilliantly colored blossoms. Unfortunately, due to overbreeding of similar strains, many Northwest gardeners gave up on growing the tall Delphiniums because the available plants lacked vigor, were susceptible to powdery mildew, broke easily in storms and rarely survived for more than one season. It’s time to give these gorgeous plants another try. Thanks to a breeding program in New Zealand, much more resilient Delphiniums are becoming available at local and online nurseries. Do a search for “Buy Dowdeswell Delphiniums in the United States” to find these new and improved hybrids. They are reliably perennial and highly resistant to powdery mildew, and produce sturdy flower spikes. There are many Dowdeswell hybrids available, but my all-time favorite is Delphinium elatum ‘Cobalt Dreams’. This is the bluest of any flower I’ve ever grown, featuring gigantic flower stalks crammed with extra-large flowers. ‘Royal Aspirations’ is a close second. 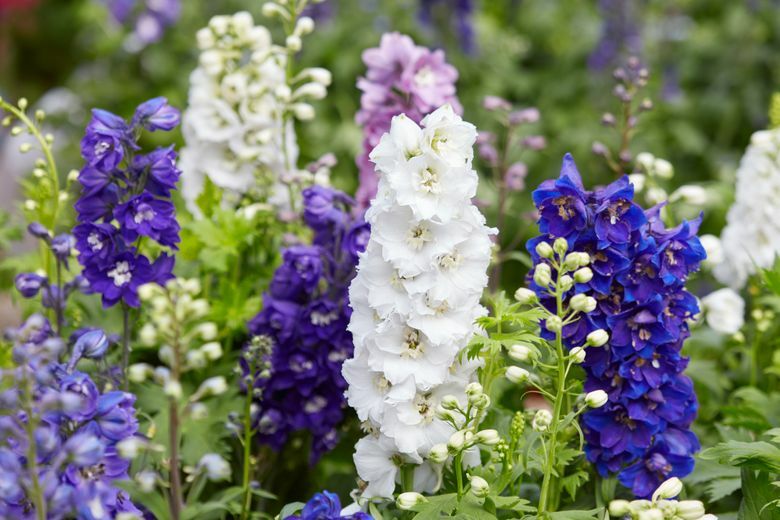 Even the much-improved strains of Delphinium need care in order to make sure they perform at their best in your garden. The trick to getting them to come back every year, not to mention getting them to bloom magnificently at least twice per season, is to never let them dry out. When you plant your Delphinium, incorporate large amounts of organic compost. Mulch over the root zone to slow evaporation, and water as often as necessary to make sure the soil remains slightly moist at all times. Delphiniums are also big feeders. Work a couple of cups of alfalfa meal and a cup of organic flower food into the soil around the root zone every six weeks beginning in early April. Delphiniums die back after they bloom. As soon as the first flush of flowers fades, cut the flower stalks back to lateral buds immediately below the spent flower. The secondary flowering branches will be much smaller and less showy, but still will make colorful additions in flower arrangements. After the secondary flowering is complete, the branches will begin to die back. Cut all of the stems down to newly developing basil foliage at ground level. Keep the soil moist, and continue to feed regularly, and your Delphinium will quickly grow back and rebloom again in late summer. After the second bloom ends, cut the stalks down, and cover the stems with about an inch of compost. Your Delphinium will return to put on a magnificent show again next spring. The biggest problem with growing Delphinium elatum is figuring out how to stake them. Even the newer, sturdier strains are subject to wind damage. Avoid planting these titans in a windy location. Even if you stake them well, strong winds can break the stem where it’s held up by the stake. In my opinion, the best staking system is the circular grid support available at local nurseries. This system consists of a wire ring filled with a pattern of crosswires. Metal supports inserted into the ground hold the ring in place a couple of feet above the ground. The secret to success is to center the ring directly above the crown, and set the system up early enough in spring to allow the stems to grow up through the grid. Once the stems grow through, the grid does a great job of holding the stems upright. Prune out any stems that grow outside the circle. Only a fairly ferocious wind storm will cause the clump to fall over, or break the flowering stalks. Best of all, once the stems grow through the grid, the foliage totally hides the staking system. Don’t make the mistake I did last year of leaving the staking systems out in the garden after the season ended in fall. I’m still searching for some of the support rods hiding in the garden!